It is now easier than ever for London’s creatives to hire photographic and video equipment from Hireacamera.com. This week sees the launch of Hireacamera’s all new ‘Click and Collect’ service. As part of an expansion of services offered by Hireacamera, it will now be possible to collect and return hired equipment to their new London base at Cherryduck Studios in Wapping. At the moment, this service is only being offered to photographers, filmmakers and creatives working within London, but is the first stage of wider plans to roll out a ‘Click and Collect’ service nationwide. But that’s not it for Hireacamera and Cherryduck Studios. With over 21,000 sq ft of creative space, Cherryduck Studios is a one-stop shop for video and stills content, featuring six studio spaces and a team of creatives, directors, editors, animators and camera operators all under one roof delivering everything you need to tell your story. Which is why Hirecamera has chosen Cherryduck to deliver its very first Live Broadcast, next week on Thursday the 15th of June. 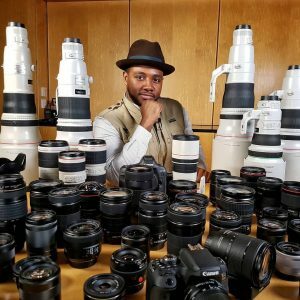 During this first foray into Live video, Guy and pro photographer David Newton (photopositive.co.uk) will be sharing their experiences from the recent Hireacamera US Road Trip and giving their verdict on gear they used, including the Fujifilm GFX 50S, Panasonic LUMIX GH5 and a whole host of accessories.